State Governors on the platform of the Peoples Democratic Party, (PDP) and stakeholders have resolved to work with any candidate who emerges as the party’s chairman at its forthcoming national convention in Abuja on the 9th of December, 2017. A Government House statement by the Chief Press secretary to the Bayelsa State Governor, Francis Ottah Agbo, says the decision was reached at a meeting of PDP Governors on Sunday in Enugu. The meeting was also attended by the National Chairman of the Party, Alhaji Ahmed Makarfi, Deputy Senate President, Ike Ekweremadu, Senate Minority Leader, Godswill Akpabio, some former Governors, ministers and other party chieftains. Speaking shortly after the meeting in Government House, Enugu, Chairman of the PDP Governors’ Forum, Governor Ayodele Fayose of Ekiti State said the decision was taken to protect the party’s interest above other considerations and conduct a free, fair, transparent and credible convention that would serve as a template for other political parties to emulate. The Ekiti Governor, who expressed his conviction that, the PDP would clinch victory in the 2019 general elections, also called on the Independent National Electoral Commission, INEC to conduct the forthcoming Anambra Governorship election on the 18th of this month in a free and fair manner “that would not only be credible but seen as credible and acceptable” by all. 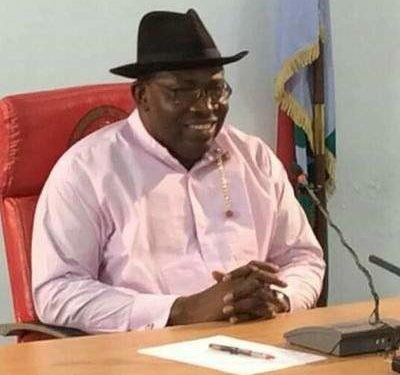 Also speaking to newsmen on the outcome of the meeting, Governor Seriake Dickson of Bayelsa State renewed his call for a level playing ground for all PDP chairmanship aspirants, stressing that, it would also strengthen the internal democracy of the party as well as unite its rank and file across the country. He commended his fellow governors and other stakeholders for their efforts at repositioning the party for a successful outing come 2019. Governor Dickson also appreciated the aspirants for their sense of maturity and concern for the overall wellbeing of the party, noting that, their decision to support whoever emerges victorious at the forthcoming party’s convention would go a long way in putting the PDP back in a sound footing for the task ahead. The Governors of Rivers, Abia, Delta, Cross River, Akwa Ibom, Enough, Taraba and Gombe states attended the meeting. Also in attendance were former Governor of Anambra and Jigawa States Dr Peter Obi, Alhaji Sule Lamido, one time Senate President Adolphus Wabara among other party stalwarts.